People always say that ignorance is bliss. Ignorance is hell not bliss because you don’t know what you’re missing with all the knowledge of this world and the next. This mindset coaching article will throw ignorance to the gutter real quick like. Forget about the people who continue to judge and cast their opinions. Let’s first start with the definition of ignorance because I didn't even know the exact definition. lack of knowledge or information. Too many people are quick to judge others because of ignorance. The lack of knowledge or information holds them back from evolving. Since they can’t get out of their head they live in fear. That fear comes out as judgment and is spewed onto you when they say things like, “Wall Push-ups aren’t real push-ups” and “those squats aren’t even enough movement to do anything for you, so why do you do them?” Fear. Because you’re willing to let fear go and welcome the unknown, the people around you won’t recognize what you’re doing. It’s ok to let them think what they want. They are going to talk about you and judge. Let them do all of that. Because when you’re 180,190, and 250 days into your WODs Consecutively, they’ll see. Above all, forgive them and love them for it. Love sets every thing, every body and every place free. The knowledge, information, and experience a person gains from committing and doing the WODs every day is like none other. Therefore the WODs suffocate ignorance. Also, the mindset coaching articles provide the education to change from the neck up so you can change from the neck down. 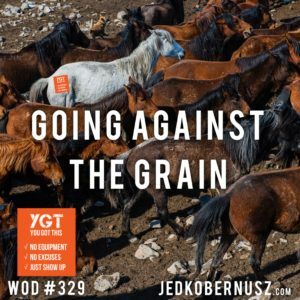 I shot my WOD about this topic on Facebook live. Watch how fired up I was about ignorance. Nothing pisses me off more than mean people and people who judge others. Please consider sharing that video to your timeline because those who hate are gonna hate. Fire back at them with that video. Also, I was very fired up because of YOU. This Podcast episode will fire you up too. Tap Here To Listen. 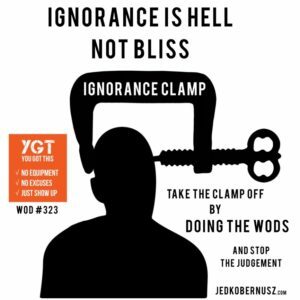 Ignorance is hell not bliss and by getting this WOD done you’re doing the work to become the best version of yourself. Prove to yourself that you’re worth the work and dedication. You are to me. The haters will come around because there will be no other option. I use to think I could save the world, but after starting this journey of 365 WODs I soon realized I needed to let people get to their lowest of lows before I can truly help them. Letting someone get to their lowest lows seems very cold, but it's a necessary part of any change. Before we moved to Roseau Minnesota I use to drive from Mound to South Minneapolis. It was anywhere from 45 minutes to an hour and a half one way. It was ok because I found something to occupy that time. I use to record myself talking about various topics and I called it THE Exercise Physiology Show and also called it Talk Therapy. It didn't really take off as I thought it would, but really it helped me become the person I am today with all my videos. A person could look at that adventure as a failure, but I look at it as a learning opportunity. Learning what video looks like from Gary Vaynerchuk, I tried to keep up with him. I soon realized that he has been doing videos for way longer than I have. To this day I am still learning and love to explore what people respond to. Nothing fascinates me more than the habits of human beings. Letting someone get to their lowest lows means watching those habits and when you've been paying attention to those habits as long as I have you know what's going to happen next, but can't save people from their own crap. My experience is just that, mine. The entire process of changing is subjective and the “experts” have tried again and again to duplicate that system with all these theories and models. My coaching tactics are basically suggestions. When people come to me for help, they are surprised at how much I don't do. It's simple, what outcome do you want? How much are you willing to change to make that happen? If you feel like you're giving something up in order to be that person, then you're not ready yet. Letting someone get to their lowest lows and standing back while they tell everyone that they are doing it when they're not, is part of the process. We first look for affirmations from others in the external world. Some look to social media, like Facebook, Instagram or SnapChat. They start to use that as a motivator. Posting pictures of themselves, hoping someone will like comment or share their journey. They go strong at first but after a certain amount of time the novelty wears off. When on one is praising them for their “hard work” they give up. The motivation to keep going doesn't come from a like or a comment. It comes from within. That deep down feeling of just doing it because you have to. Doing it because if you didn't you would cease to exist and die. That's why I create daily WODs because if I didn't then I would no longer have a purpose to learn new movements and challenge myself. The truth about change is this: Nobody Gives A Crap About YOUR Change. They don't want to hear about what you're doing. They want to hear about what you've done. Too many people talk about what they're doing without proof. Having that proof is a shift in today's world. Actually, it's always been that way, but with the internet taking so many strides in the last 20 years, it's easier to cut through the BS. After driving to that job for a couple years I hit my lowest of lows. I started to change my focus from being far away from family to being as close as possible. I wrote an entire blog post about that. Go Here if you want to read about that. It was the start of the best series of blog posts I've ever written. Letting someone get to their lowest lows is the way to do that. Robbing someone of doing that will only prolong that process. I've learned to sit back and let people do what they do until they truly are ready and knowing WHEN they are ready is a skill in itself. One of the best ways to do that is to have a massive amount of self-awareness. The amount of self-awareness is also subjective but a few names of people who have that level of self-awareness are Gary Vaynerchuk, Tony Robins, Opera Winfrey and Dwane The Rock Johnson. In conclusion, letting someone get to their lowest lows can take time and that's ok. Simply commit to one round of my WODs a day. Obsess about yourself in a way that comes from your heart. Don't go to bed until you get that one round done and be proud of it. Letting someone get to their lowest of lows is the most important part of the process because there's nowhere else to go but up. 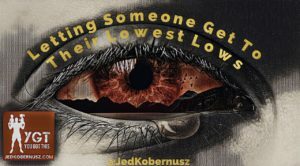 Did you enjoy this post about how letting someone get to their lowest lows? Please share and/or comment below. Have you ever noticed that when you’re ready to give up that's when whatever you've been working SO hard on seems to happen? Wanting to give up will actually help because as soon as you stop trying to force the outcome and simply allow things to happen, they do. As I sit here an write this, I am allowing the words to come. I create these WODs from a place of love and science. Sometimes I let the fact that after I posted the video there aren't many views. Come to think of it, I USE to let that get me down and have thought SO many times about giving up. Then someone reaches out and says they've lost SO much weight or they've gotten SO much of their life back through their strength back because of my WODs. In the beginning of 2018, I started teaching fitness classes in these two small towns. For the first few classes, I had zero people show up. After the third class of now shows, I told myself that if I don't have someone next week, I'm done. I completely surrendered the notion of trying to control the outcome that there were no more expectations. I took my attention off the fact that I WANTED people to show up. It's fascinating to think about what happened. Wanting To Give Up Will Actually Help You! See what happened there? I kept putting the energy out there that I was HOPING that people would show up by subconsciously I didn't believe that anyone would come. Then I let it all go by being ok with no one showing up. Then it happened. The best part of all of this is to understand what you're doing consciously AND subconsciously. It takes constant practice. That's why I create these WODs. When you commit to one round a day of the next WOD, the expectations are gone and you start to operate for a place of unknown. Loving the unknown sounds scary, but you'll soon learn to love the unknown. This was a short and sweet insight into why wanting to give up will actually help you. Trying to control everything in your life will actually turn you into a bitter person. Learn to let go and be love the unknown. Sometimes you just have to take the leap and know that you're going to be ok. So be ok with wanting to give up and actually get at least one round of the WOD done today. If you get more without even trying, then you KNOW it's because wanting to give up actually helped you. It's ok, we ALL want to give up at some point, it's choosing to NOT give up is what defines us. Keep up the great work and keep going. Don't forget to have fun on your journey. PSS: If you found this WOD about how Wanting To Give Up Will Actually Help brought you value, consider making an in-kind donation. That way I can keep helping you out. Go Here To Donate. Thank you for your time, attention and generosity. If you enjoyed this post about how Wanting To Give Up Will Actually Help, then please tweet, share and/or comment on what you liked most. Don't have time to go to the gym? Want that belly fat gone? WOD #163 will provide you will belly fat exercises at home that will not only reduce the belly fat but also strengthen your core. The WODs that I create not only provide a daily shock to your system resulting in more caloric deficit. They also show you the exercises to reduce belly fat with videos. These exercises today's are exercises to lose belly fat fast. I also refer to exercises as movement because sometimes the word “exercise” can trick your mind and put your movement on the back burner. Think about why you put on cloths. I bet you don't really have an answer. Accept for because I HAVE to. Why don't we ever put our movement in that same category? Think about that today as you go through the WOD. Let that really sink in. That's just the cold hard truth folks. Now before we get to it, I want to hear from you, the Kobernation. Is there anything you want me to cover? Anything you want to know more about? Comment below and I'll hook you up. Was this WOD helpful? Feel free to share and comment. Considering Coaching in addition to your current routine? 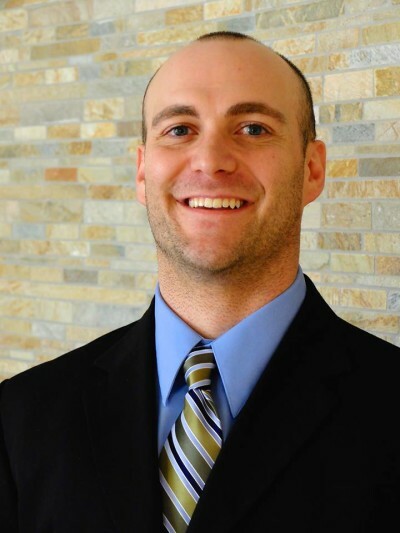 Go to the Coaching orWork With Me page to find out more about my approach to weight loss that has helped MANY people. If you enjoyed this post about Belly Fat Exercises At Home , retweet and comment below what was most noteworthy please.